The days at arki_lab office are never the same, it is dynamic, lively and full of experiments, meetings and workshops. This tuesday was one of those days, where the office was extra dynamic. We started our morning on the rooftop in the sunlight, where students from the Royal Academy of Architecture interviewed some of us about arki_lab and our methods. We have been selected as a case in a course about “practical methods”, where the students should apply qualitative methods, interviews and research. The aim of the course is to train the students critical sense, and that they get an insight in all the different methods that are being used in architect studios. We are very happy to be chosen for the course because we are able to present a different approach in the architect profession. Userdriven and democratic processes is something that slowly is being more recognized and implemented in the planning process, which we of course are really happy about. After the interview we went down and joined the office, where DIS students (Danish Institute of Study Abroad) worked on their urban project about transforming Balders Plads. The course is facilitated by Rasmus from the office, and the students were on a visit to get a better understanding of our working environment and our planning approach. 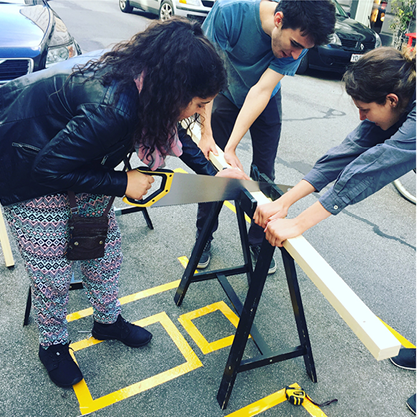 Also they were here to help out the students from Blågårds School with building for Park(ing) Day, which is on next Friday (We are very excited about it and you are of course invited! Read more about the exciting project in our recent blogpost here). In this way the students from DIS would be more experienced with building 1:1 and get insight in how to engage young people in the urban space, which is a usergroup that they want to involve in their own project. The students from DIS rolled up their sleeves and were fully engaged in the building session with the students from Blågård School. The whole street was full of wood, tools and students in many ages building new benches, experimental trashcans and a lot of other interesting elements. People walked by with a curios smile, and the working process was an event it selves. It was very inspiring to experience the dynamics and cultural meeting between the American students and the young people from Blågårds School. The practical teamwork broke down some social barriers, so they could meet and talk together in a new way. It was a great learning process especially for the 7. Graders, who got the possibility to practice their English skills, and also had to apply some mathematical knowledge when deciding the scale of the elements. It was a great day, and we really enjoyed the energy of all the young people and seeing how they could benefit from eachother. We are looking forward to experience the outcome of all the different projects. Remember that you can experience one of them yourselves on Friday the 18. of September between 16-18 pm. Hope to see you there!